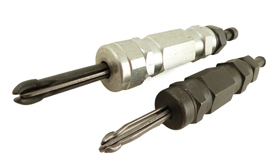 MRO TOOLS Super Long Grip Hex-Nut Cleco Fasteners (KHNK) are designed to be operated with a pneumatic power tool and are best suited for high-production settings that require fast, consistent and uniform clamping force. MRO TOOLS Super Long Grip Hex-Nut Cleco Fasteners feature a free-wheeling design that allows it to back completely off while still remaining intact with the body. MRO TOOLS Super Long Grip Hex-Nut Cleco Fasteners work well with all types of metallic and composite materials. MRO TOOLS Cleco Fasteners are widely used in automotive, racing, and aircraft sheet metal repair. MRO TOOLS Cleco Fasteners are designed to temporarily fasten multiple sheets of material together before the pieces are permanently joined. MRO TOOLS Cleco Fasteners are a simple and inexpensive alternative to competitive fasteners and are available in various lengths and strengths to accommodate different processes. The MRO TOOLS KHNK-FW3/16 Super Long Grip Hex-Nut Cleco Fasteners is one of thousands of quality tooling products available from MRO Tools. Please browse Super Long (KHNK) 1 1/2''-2 1/2'' Grip Hex-Nut Cleco Fasteners for tools similar to the MRO TOOLS KHNK-FW3/16 Super Long Grip Hex-Nut Cleco Fasteners. MRO TOOLS KHNK-FW3/16 Super Long Grip Hex-Nut Cleco Fasteners description summary: MRO TOOLS Super Long (KHNK) 1 1/2''-2 1/2'' Grip Hex-Nut Cleco Fasteners. Color: Brass Diameter: 3/16'' Drill Size: #10 Grip Range: 1 1/2''-2 1/2'' Quantity discounts may be available for the MRO TOOLS KHNK-FW3/16 Super Long Grip Hex-Nut Cleco Fasteners. Please contact MRO Tools for details.